Quite often when I'm starting to peruse about the whereabouts of a city, I start with the choice of its naming because it occasionally gives inklings of the people penchant of center of attention. Be it narcissism like Alexander the Great in his Alexandria spree or another reason, there is often an underlying reason. It's not like one build a city and name it randomly Xorxor because one feels like it. A reason when the public was called to name new exoplanets, there are rules to respect to avoid randomness. Anways, regarding the term Kerma as the old settlement dating as far 7000BCE (IIRC), I still haven't found a single hint about who started to name it like this (if it was named by a archeologist) or whence does it come? I've heard stuff like "red mound" or something to deffufas, but it all seems inconclusive. I can't even find who started it or anything on which it was first mentioned. Meroitic tablets, hieroglyphics one, etc. Nothing. Nada. So many times authors talk about Kerma (or Karmah) culture, but nobody every tries to know where does it come from. I know Reisner and Charles Bonnet could be excellent start, but I prefer avoid entire book (report) that might be very technical for such a small goal. So, perhaps, experts or dilettante of Egyptian Dreams might know references from which I can start. After two hours, I think help might aver useful. Posted: Mon Apr 07, 2014 6:33 pm Post subject: Digging. "However, the site only becomes truly famous when G.A. Reisner (1867-1942) conducts excavations there between 1913 and 1916. He identifies a unique culture to which he gives the name of the modern town located nearby." At least, I finally found who between Bonnet and Reisner gave the denominatin. Now, I'm confused. I thought the modern sudanese city was Dukki Gel and the ancient Kerma was 1km nearby. 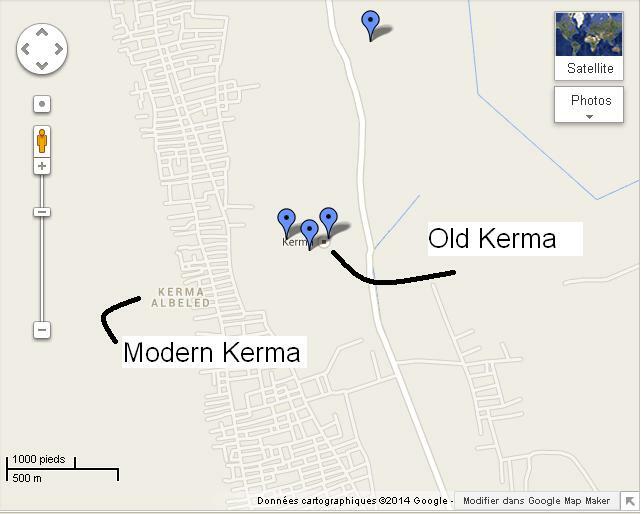 What modern city named Kerma? I need to delve into this more. If not by external help, I'll find it. Posted: Mon Apr 07, 2014 7:38 pm Post subject: Q.E.D. Oh well, although not necessarily entirely conclusive since I had to merge parts by myself wihout any linguistic background, I have finally found whence comes Kerma (or Karmah). First, it is entirely not ancient nubian nor egyptian. It was rather obvious I should have guessed. Before meroitic writings, there was no writing in Nubia. As said, it is George Reisner who is the one who named the ancient Kerma according to a modern nearby town named Kerma. That modern town is along the Nile and called Kerma Elbeled (Albeled), meaning literally the town of Kerma. Kerma means "vine" in arabic from which wine is made. This is not new since Nubia had vine presses to produce wine and it seems there were strong producers of wine, making sense over time, that region took the toponymy of "vine" according to the production of vine. Although not of nubian legacy, it ties to one prime activity of the region over generations. Anyways, it has nothing to do with ancient Nubians in the end.